Did I Make it Through the Movie? It was a great night at "The Dark Knight" this past Monday. I made it through nearly three hours of sitting, no symptoms, and felt fine the next day and this morning. So, this opens up a few more options in my world. I can probably travel by car or plane. Sure, I'll still be careful and use a lower back support, get up every hour or so and move around (which makes car travel a little longer) but having the option is a very liberating feeling. Several people have asked me, "So, do you think you'll still need surgery?" No. I think that door is now closed. But, alone, they're not enough. What matters most about a goal is what you learn from the process of trying to reach it. The plan to get what you want or where you want to be changes, sometimes from day to day, and, as a result, you change. If your plan includes others, you learn from them; they from you. If not, you learn from you. Tonight, I will plant myself in the back row of one of my favorite movie theaters, The Alamo Drafthouse, to watch, "The Dark Knight" and, no doubt, learn a lot. I'll learn if my preparation and planning to achieve this goal paid off or if I need to revise my plan. Will I come home feeling good and excited about revising my goal list and creating some new things to accomplish or will the Painster bump me from my seat and force me to revise my plan? Either way, it's a win and the only way to win is to play. If you want to know what a person believes, watch his or her actions. People do what they intend to do. Consciously or not. One of the behavioral red flags I used to teach my students to watch for was this phrase (or something similar) from clients: "I'll do whatever you say. I just want don't want to hurt anymore." That's code for, "I'll pretty much do what I want and grumble about it later." Now, people are not sabotaging themselves on purpose. They likely really do want to get well. They just have a huge gap between what they think and what they do. I call it the Crap Gap. Some of us have a Crap Gap the size of a small river stream while others, it's the size of the Grand Canyon. Either way, to get what you want out of life, which means getting what you need out of your body, you have to close the Crap Gap. You have to be honest and live authentically. How do you do it? How do you close the Crap Gap? Well, it doesn't help a bit to lecture people about how important exercise is, how much better they'll feel, or how if they don't get moving, they'll shorten their life. 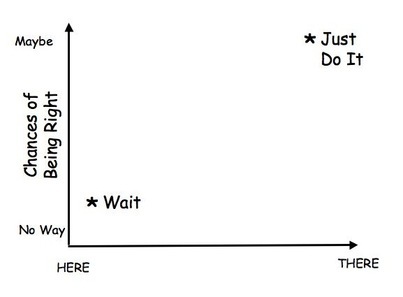 I did this a lot (sorry folks) and was really good at telling people what they ought to do. And, people would nod their heads, and say "Uh-huh" or "I understand" and then do little to nothing of what I said. Finally, I learned how to do it right; how to change behavior. But, most of modern medicine (and I include all ancillary care in there as well) still functions in the "lecture" mode. Result? People just keep doing what they have been doing: living in the Crap Gap. You change the cycle by using behavioral strategies and being honest. Give written instructions with clear objectives and hold people accountable. You need action; not words. Remember that keeping a small promise is a lot easier than keeping a big promise and keeping promises, especially to your self, is what closes the Gap. There's a phrase Londoners use as you get on the train. It's "Mind the Gap." It's to help you avoid falling in the sometimes significant gap between the train and the station platform. Keeping your promises is what helps you "mind the crap gap." For those of you with osteoarthritis struggling with joint pain, you probably know by now the importance of having fish oil in your diet (a great source of Omega Three Fatty Acid) to fight chronic inflammation and pain. Thanks to Dr. Michael Eades, the author of the Protein Power, I learned of Krill Oil - a super charged supplier of Omega Three Fatty Acids. Krill Oil has 48 times the potency of fish oil. You can find Krill Oil here. This is brilliant. Click "Just Do It" to find out. My brain needed some magic today. I found it here. I slid into a hornet's nest of frustration and anger the other night. It was ugly. A true Jekyll & Hyde moment. One minute, I was patiently installing the worst operating system in the universe, Windows, seemingly under control, then the next, a Niagara Falls of negativity and profanity came spewing from me like projectile vomit. For those of you who live in the dual worlds of Mac vs. Wintel, you know what I mean. For those of you who have only known Windows, well, it's like only having an outhouse. You appreciate the outhouse, but once you have indoor plumbing, you'll never want an outhouse again. Once I cooled off, which took a good 24 hours and even Elle knew not to venture too close for fear of losing a limb, I gained some perspective. I remembered about the power of words. With my clients, I often would listen to their language and help them discover the subtle ways they were undermining their own progress by the language they chose. And, the operative word is chose. We choose what we say which rises from what we think and from what we believe. Listen to your words for a day and you'll discover a lot about what you believe about your self, your future, your possibilities. Words become things. But. This is usually preceded by, "Yeah." It serves to undermine and diminish what the other person has said. Just don't know use it. If you're tempted, stop, listen to the other person and try something like, "I understand. How do you feel about (and insert your concern here)?" This keeps the conversation going and maintains a connection. If you're wondering why your conversations seem one sided it's likely because you're But heavy. Never. Never is an emotional veneer. It removes risk and protects you from feeling the prospect of failure. One of the first times I heard never used in medicine was with a young woman, a patient of mine, who had been strangled and suffered severe loss of blood to her brain. She was comatose; unresponsive. Every physician uttered the same words - "She'll never go home. She'll never do ....." Doctors (and other clinicians as well) sometimes hide behind "never" because it's easier than facing their own uncertainty and admitting they don't know; being wrong. The family didn't believe it. Well, one day, she woke up. Started talking. Eventually, she went back to school. So much for never. Should. There are two circumstances that the word "should" shows up. The first is when you're not sure but feel an obligation. "I really should start walking" or, "I should be better by now." When you use "should", you place yourself in a subtly negative mental state. The mind, in keeping with its elegantly efficient design, begins searching for evidence in your day to day life to support the idea that you "should be better". So, instead of focusing on what you need to do so you WILL be better, you focus on what you do not have or cannot do. And, although the cycle is painfully uncomfortable, it becomes increasingly difficult to break. The second circumstance of "should" is when you tell someone else what to do. "You know what you should do?" or, "Well, this is what I think you should do." Instead of telling someone what he or she should or shouldn't do, ask questions. Re-frame your strong opinion, which could be completely without substance, into a question about how the other person feels. "So, how would you feel about doing (insert your opinion here)?" feels completely different than, "Well, what you should do is (insert your opinion here.)" Now, I would like to tell you that I have perfected the use of words to craft my present and future circumstances and have seamless, bubbly conversations but, well, that would be a lie. I work on my word choice everyday and am always stunned at the subtle infusion of negativity in my mind and in my words. My most recent effort is something very simple. Each morning, no matter how I feel, I say, "Something great is happening today." I felt silly the first few times as if someone was going to quiz me later to prove that it actually happened. But with a little persistence, it's not so silly and I spend the day looking for something great. Yesterday, I went for a jog on the Newton. It was for just 90 seconds but it felt great. There you have it. Something great. For some people, walking around the block wears them out. For others, running a 10k is energizing. Some can swim a mile; others can dog-paddle 25 meters. The amount of oxygen you carry in your blood and the amount Dara Torres, for example, carries in her blood is about the same. It's how we stay alive (and don't have to be very fit either). Yet, Dara, at the age of 41, made the US Olympic swim team - for the fifth time. Physical exertion depends on oxygen delivery and the more you train, smartly, the better you get. Dara Torres' delivery of oxygen to her working muscles is like Federal Express: quick, efficient, dependable. If you dog-paddle 25 meters and have to quit, your delivery system is more like the Pony Express. If you want to get more out of your life, change the Pony Express to Federal Express, train (read more about Dara' training here ). Training is exercise but exercise is not necessarily training. Training is goal driven, specific, measurable, consistent. Exercise is physical activity. See the difference? What's keeping you from training? When I looked at the MRI film, I wasn't sure. Was I was looking at mine? Or, maybe I was looking at the wrong level of the spine. "Gordon, that looks a lot different to me. Am I seeing what I think I think I'm seeing?" I asked Dr White. "I know. It's remarkable. I had the same feeling when I first reviewed the films. I expected the films to be better because your nerve function is good, muscle strength is good, but I never expected this," replied Dr. White. Disc herniations like mine - large and non-fragmented - rarely shrink according to conventional medical views. They almost always require some type of invasive procedure; epidural injection or surgery because of the pain severity and degree of disability. "So, then, what does this mean going forward? What do you think? Do I still need an injection?" I asked. "I think, with this kind of improvement on your MRI and your physical improvements, you should just keep on doing what you're doing and we should just wait on the injection. I don't think you need it and it's an invasive procedure," explained Dr. White. I'm a controlled sort of guy on the outside (although learning how to let go) but inside I was turning cartwheels, jumping around, yelling, laughing, crying all at once. I just nodded, smiled and said, "Awesome. That's just so awesome." So, where did my herniated disc go? Well, research over the past decade has shown that about 60% of people with herniations will experience what is called, "disc resorption." The extruded disc material is treated like a foreign protein by your body and your body, basically, digests it. But, to do this it needs access to blood and it turns out, paradoxically, that the larger the herniation, the better your chances are for resorption (and keep in mind that convention wisdom and practice is often 10-20 years behind research which is why so many people will disagree with this view). Since my herniation was large and even pushed on the spinal cord, I had statistically a good chance but I still had to maximize the blood flow to the region. You might be wondering if there was one thing that helped me shrink my disc herniation and the answer is yes: a complete overhaul of my lifestyle and not just for a few weeks but forever. I'll get into that soon. For now, I'm just going to savor what I have, how I feel, and where I'm going next. 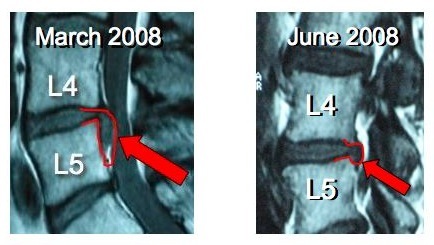 Mochida K. Regression of cervical disc herniation observed on MRI. Spine 1998;23(9):990-997. Ellenberg MR. Prospective evaluation of the course of disc herniations in patients with radiculopathy. Arch Phys Med Rehab 74; Jan 1993, p. 3. Bozzao A. Lumbar disc herniation: MR imaging assessment of natural history in patients treated without surgery. Radiology 1992;185:135-141. Friday morning arrived at the front door of my mind carrying with it plenty of sluggish luggage. When I didn't answer, it just knocked harder, louder, longer. Finally, I chugged and sputtered out of bed feeling like my brain was coated in a thick jelly. Hung-over is too gentle a description. "Coffee - that'll help," I thought. As I sipped my third cup, the true length of the day settled in. "I hate MRIs," reverberated in my jelly filled head. My druggie hang over was induced by MRI Guy. "So, what are you, about 6'2"...6'3?" asked MRI Guy. "You know, at that height, I mean, we could, ya' know, do this without meds. Your head will be outta' the tube and it's only a 20 minute test so, if ya' wanna' do this without meds, I mean, we could. Of course, up to you," said MRI Guy. "Yeah, well, I hated the last one. I'll stick with meds," I said. "Ok, but, like I said it's only a 20 minute test and your head will be outta' the tube and everything, so ya' know, you could," said MRI Guy. I wondered if "WIMP" had magically appeared on my head like some sort of stigmata. "Like I said, I hated it. Meds for me," I replied tersely. He escorted Elle and me into a "SEDATION" room (and, why not call this RELAXATION and be just a pinch more consumer centric is beyond me) where I donned paper pants and shirt and skid free socks. You never know how many people will break out into a Tom Cruise Risky Business Hall Way Slide while waiting for an MRI. MRI Guy comes back after 10 minutes or so and asks, one more time, if I might, just might want to try this thing without meds. I want to punch him. He doesn't understand of course how nasty I can get without food or water; how tasty his right arm really looks right now. I have a strong urge to bite him. But, I just say, "NO" and chew up a specially formulated ZANEX which has the most bitter taste I can ever recall. MRI Guy asks me to lie down and then covers me up with a blanket. It's 102 degrees outside, and I appreciate this token gesture of customer service, but I would rather have a chilled rag. After about 15 minutes, MRI Guy pokes his head in and says,"So, how ya' feelin'?" I hate that; ask me some generic question and expect a specific answer. How the hell do I know? I'm on ZANEX, remember? So, I say, "I don't know. Ok, I guess. How am I supposed to feel?" To which, MRI Guy replies, "Well, wanna' give it a try?" as if I'm about to get on a ride at Six Flags. Yippeee! The MRI Daddy! Can I ride? Huh? Huh? Can I? These are things that float through your mind when you're on ZANEX. So, off I go into the MRI room. I lie down on the table and suddenly, as if he popped out the Dreaded Tube, I see what might be a troll standing next to me. I think the ZANEX is kicking in big time. "So, Hey there Big Guy! Are you ready? Here's the deal, now, as you slide into this tube, I'm gonna' ask you to just lift those big feet up a little 'cuz, ifya' don't, well, your knee caps are gonna' rub on the top the tube and that's not gonna' feel too good so lift'em up when I tell ya', Ok? And, don't cross your arms but keep'em up 'cuz as big as you are you're gonna' rub the side of tube too," Troll Guy booms in a big, baritone voice with the speed of one of those announcers at the end of a commercial reading all the fine print and disclaimers. Troll Guy slides me in the tube, tells me to life my feet, which I do but not enough as my knee caps jam into the top of the tub so I lift them higher until Troll Guy says "Ok, that's it." And, my knee caps are firmly pressed against the top of the tube with each shoulder snuggly packed in on the sides. Sardine comes to mind. The absolute King of Never Caring Land. I laid in the tube for 30 minutes with all sorts noise and movement and rubbing on my knee caps and pressing on my shoulders and at one point I looked up and was ALL THE WAY IN THE TUBE! You LIAR! Once the test was over, I stumbled back into the SEDATION ROOM, and made a poor attempt at dressing my self. I managed to do it but from the way Elle described it, I was aiming poorly for various leg and arm openings in my clothes. By the time I arrived home, I was trashed. As I got out of the car, I tripped over a plant, careened off one of the cars in the garage, bumped into a shelving unit and finally came face to face with the door. Big Guy was walking a like a little guy; like the 3 years old kind of little. I don't remember too much else that happened that afternoon other than trying to eat a sandwich and having a hard time figuring out that my mouth was not on the side of my face. I fell asleep for a little over three hours, got up, not sure what I did and went to bed to wake up with Friday morning knocking on my door with plenty of sluggish luggage. And, the results from all of this? What did my MRI show?